Travelers are searching more, booking more and buying more on mobile—yet most travel brands aren’t investing enough in their mobile strategy. 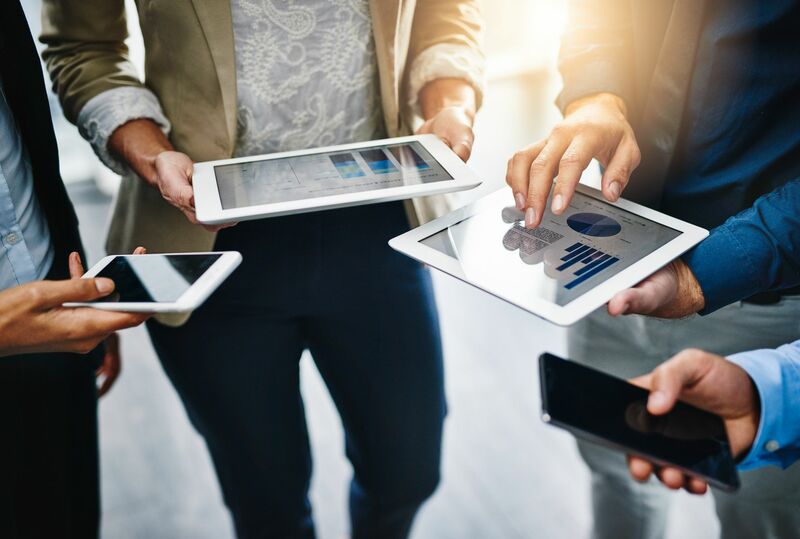 Aisling White, Head of Marketing at Travelport Digital, reveals the latest end traveler and industry research, showing how mobile is impacting travel in 2019. Almost one-third of travelers have turned to chat platforms like Facebook Messenger to search or book trips, and a staggering 81% of business travelers have used voice assistants during their travels. These are just some of the insights new Travelport Digital research has unveiled. The research forms part of the Mobile Travel Trends 2019 report and unlocks new insights into emerging areas like voice, chatbots, AR and VR and predictive analytics. Now in its third year, Travelport Digital’s Mobile Travel Trends helps travel brands to shape their mobile strategies and identify the areas where they should prioritize digital investments. With insights from over 1,100 end travelers and 100 industry professionals, the report gives a consolidated view of what customers want and what the industry is doing (or not doing) to meet their needs. So, what do travelers want in their mobile travel experience, and does it match where travel brands are heading over the next 12 months? Here are some of the highlights of what end travelers and industry professionals are saying. Have apps lost their luster? With mobile usage extending beyond apps and people turning to chat platforms like Facebook Messenger and Amazon Alexa to manage trips, some trend-watchers have predicted ‘the end of apps’ as we know them. However, traveler feedback is proving quite the opposite. 78% are downloading either the same amount or more travel apps than last year and of those downloading apps, 60% use them regularly. The main reasons travelers are turning to apps is to search and book travel, check their flight status and avail of offers. For travel brands, this shows that apps are still providing an unparalleled opportunity to engage with customers and drive revenue, through the one device they carry throughout their journey—their smartphone. If your travel brand has a mobile-optimized website, you might ask yourself, why bother developing an app? The short answer is this: travelers prefer using apps for almost every stage of the journey. 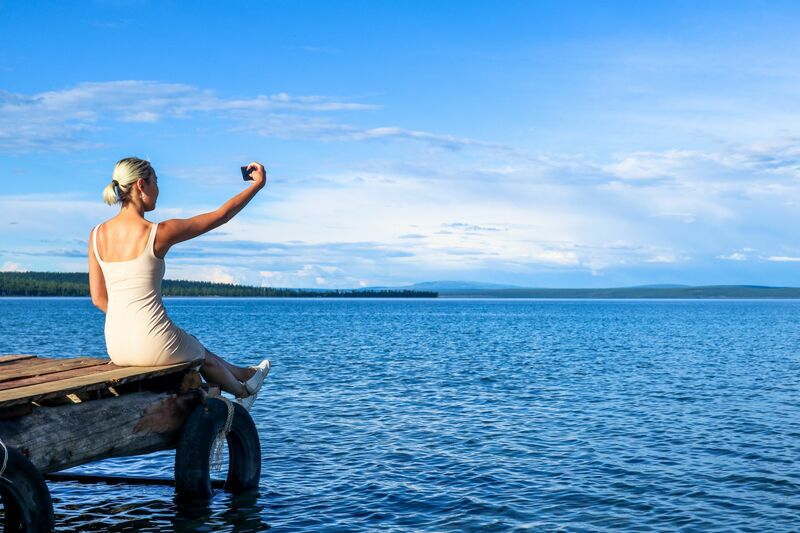 Travelport Digital’s research has shown that for the second year running, travelers are turning to the app experience over mobile web for every travel activity aside from searching for car rental and in-destination activities. 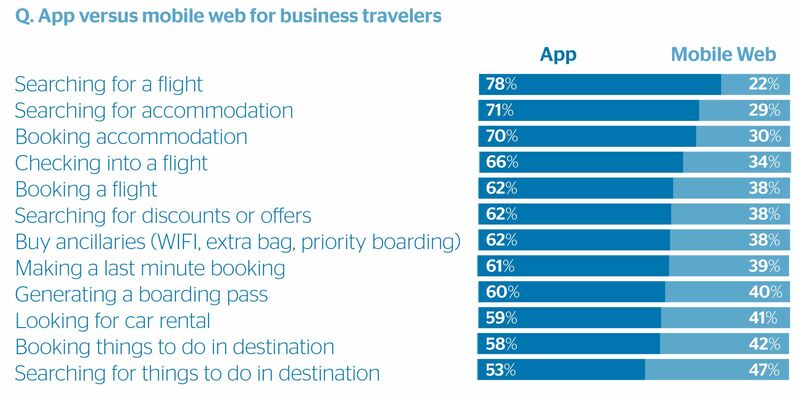 And when we look at this from just the business traveler’s point of view, apps are by far the preferred choice at every single step of the journey. While it’s clear that travelers are continuing to download and use apps, there’s a significant disconnect between what the market is saying and what travel brands are doing. Only 17% of travel brands say it’s a big focus and are investing a lot in mobile, while 46% feel they are not investing enough. 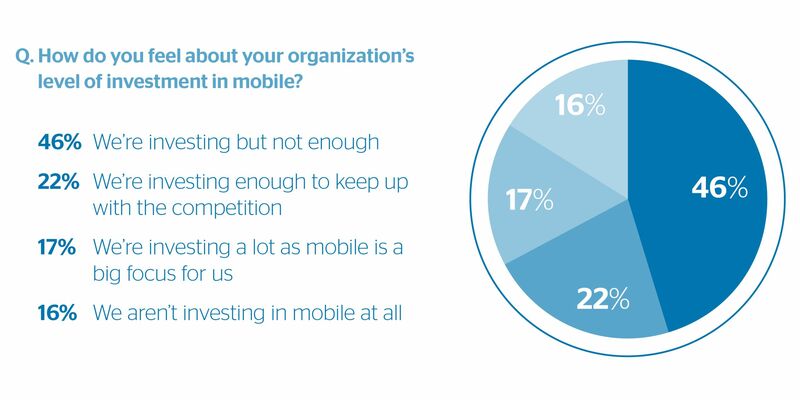 16% aren’t investing in mobile at all. One of the top trends predicted in Travelport Digital’s Mobile Travel Trends 2019 report focused on the ‘Battle for the Phono sapien’—a newly evolved species of mobile-first customer who looks at their phone every 12 minutes and checks it within five minutes of waking up. 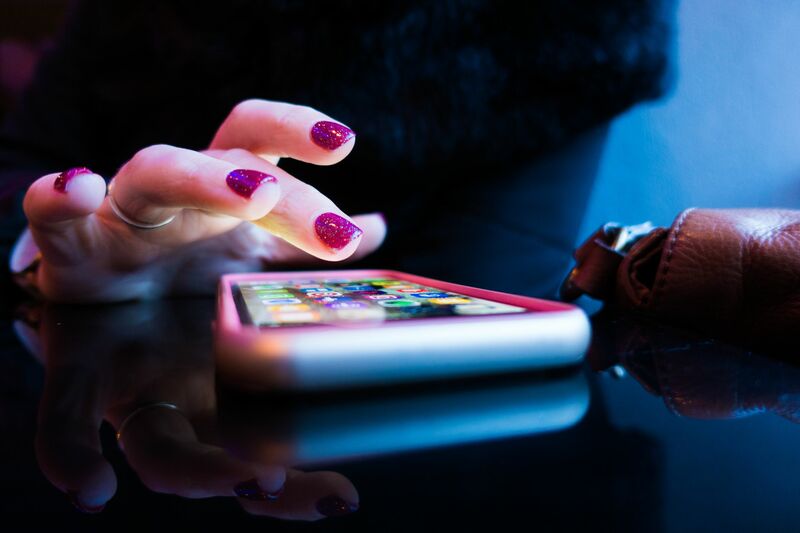 It’s clear that the brands who are not investing enough in mobile will fall behind and lose the battle for the ‘Phono sapien’ customers to their mobile-first competitors. ‘Voice search’ has been tipped as an emerging trend for a number of years, and 2019 is the year we can safely say that it has fully emerged. Voice powered technology is gaining real traction—39% of travelers have used voice assistants during a trip, primarily for flight related activity including flight status and check-in. Business travelers in particular are keen users of voice, with 81% claiming to have used mobile voice assistants during a trip. 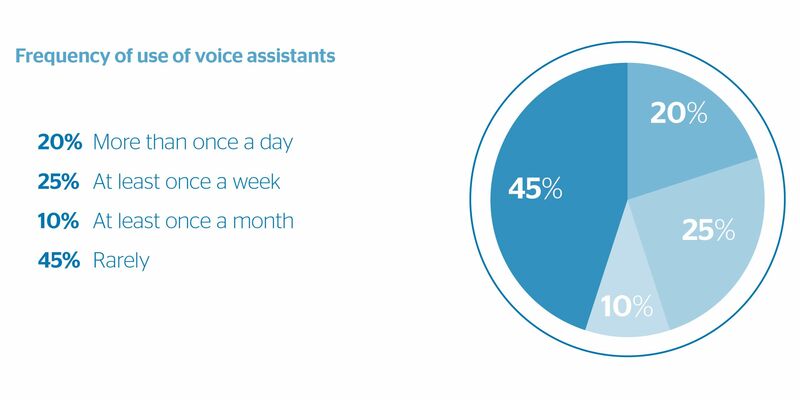 In addition, travelers are using voice assistants frequently, with 45% using them on a regular basis; 25% of those once a week and 20% every day. 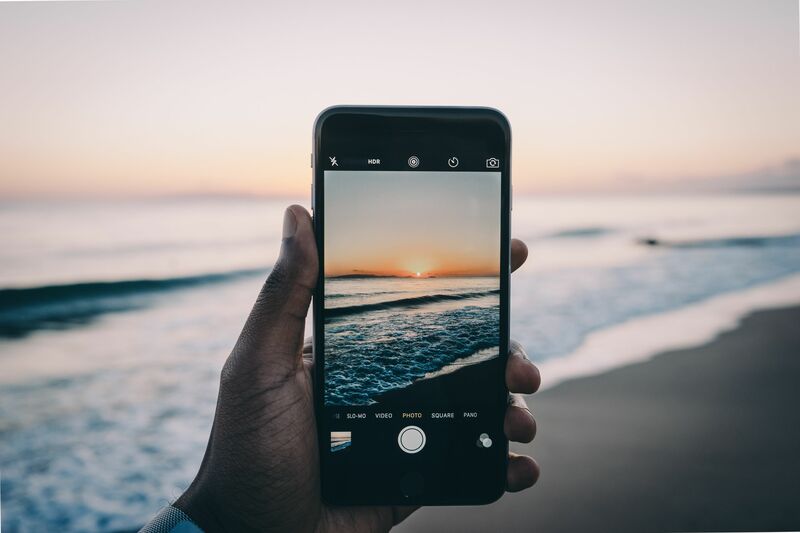 With travelers increasing their engagement with voice technology, it’s no surprise to see that 40% of travel brands will invest in voice technology in 2019. Manish Amin from Yatra discusses more about the rising trend of voice assistants in travel in Travelport Digital’s Mobile Travel Trends 2019 report. 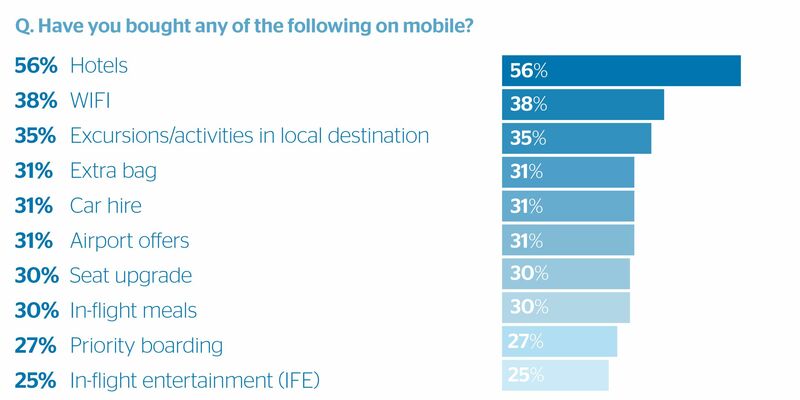 With 74% of travel brands citing ‘revenue generation’ as key goal of their mobile strategy, selling ancillaries via mobile is a top priority for many travel brands, especially airlines. As airlines move toward a ‘retailer’ model and continue to sell a wide range of products beyond air fare, meeting customer needs with relevant products and services is essential. The good news is that travelers are open to purchasing these ancillaries via mobile. Compared with Travelport Digital’s 2017 research, travelers are now buying more seat upgrades, extra bags, in-flight entertainment and car hire through mobile channels. Over a quarter of respondents have also bought WIFI, airport offers, in-destination activities, and priority boarding on their smartphone. However, it’s hotels that are leading the way. 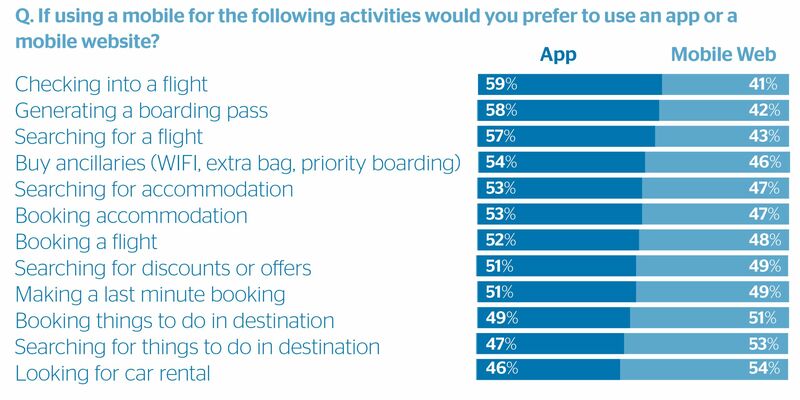 56% of travelers said that they had booked a hotel room on mobile (an increase of 6% on last year) and 62% rated hotel booking as an important travel app feature. This gives airlines and TMCs a clear opportunity to increase hotel attachment rates, and ultimately revenue, through their app. When it comes to communicating with customers, context is now every bit as important as content. 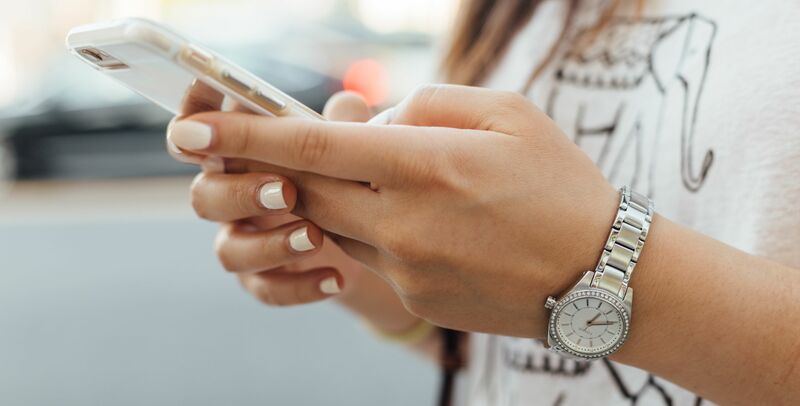 Push notifications allow travel brands to be there for their customers at exactly the right time and through the right touchpoint—and 75% of travelers agree that push notifications are useful. 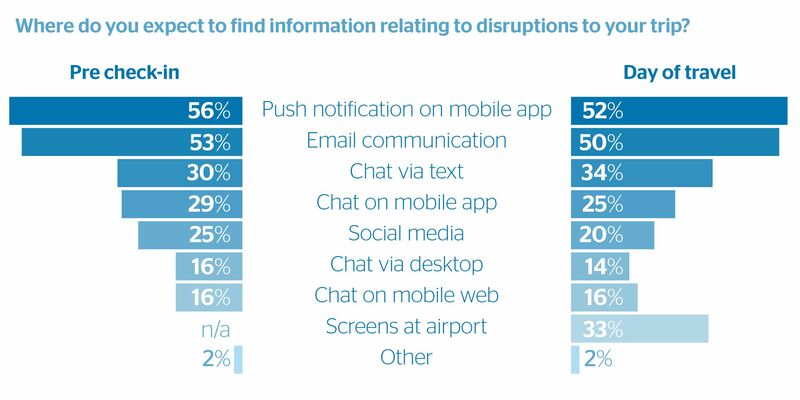 This is especially true during times of disruption, ranking as the primary way travelers want (and expect) to be communicated to both pre-trip and on the day of travel. This was followed closely by email communications, with chat gaining traction as the technology becomes more widespread. When it comes to those &apos;Phono sapien’ travel customers we’ve already mentioned, having an app is not enough. They’re looking for a joined-up experience: continuity wherever and whenever they engage with a travel brand and this includes apps, bots, voice and messaging. Travelers now expect to be able to chat with their travel brand at every stage throughout their trip, and on whatever platform they choose. Messaging capabilities and voice commands are no longer ‘nice to have’—they’re expected. Over half of travelers expect to be able to communicate with a travel brand or airline through chat via text or messaging (for example Facebook Messenger). 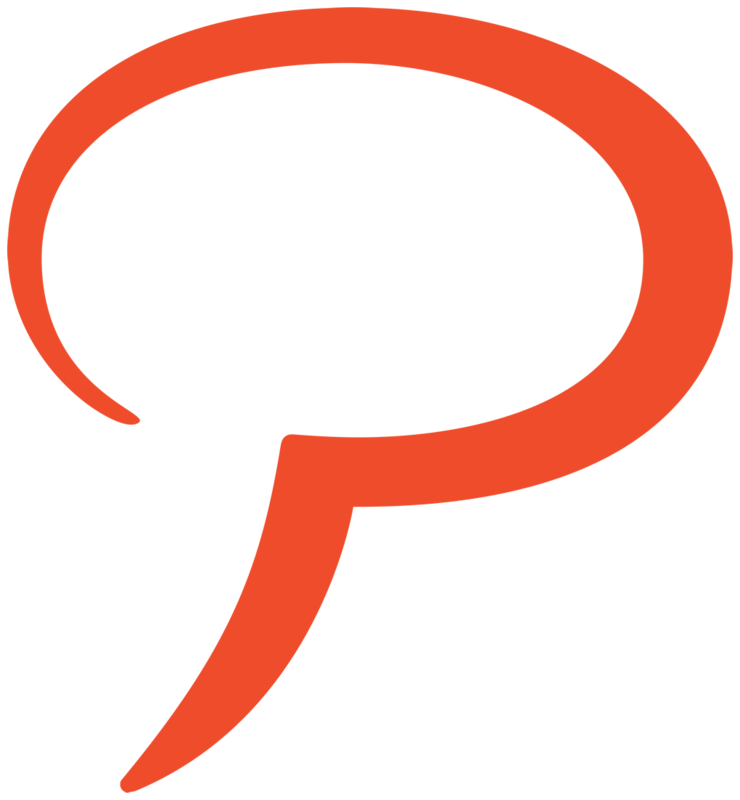 What’s more, chat isn’t just limited to questions or queries. 30% of travelers have used a chat platform to research or book a trip and 60% would be open to doing so in the future, showing the immense potential for brands to drive revenue across multiple mobile channels. How can travel brands meet customers’ growing expectations? Mobile has revolutionized how we search, review, select and experience travel. The way customers interact with travel brands throughout the travel lifecycle—from research, purchase and support right through to advocacy—has truly moved to the small screen. 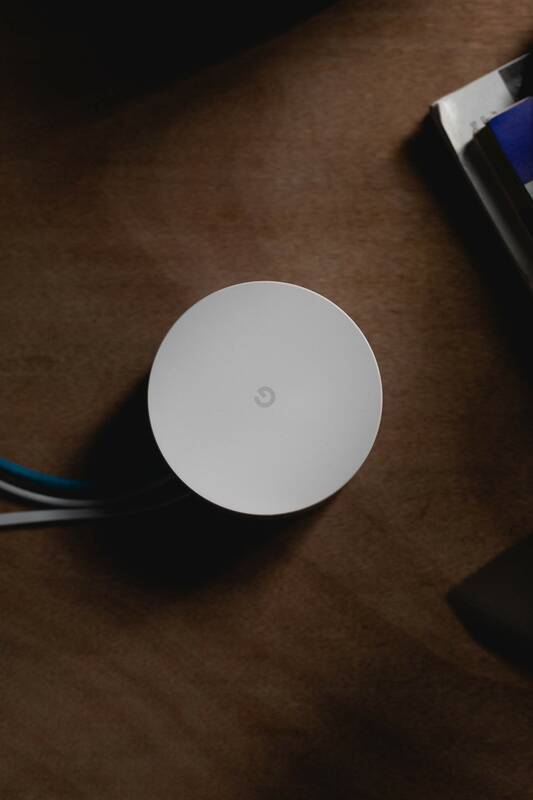 Although travelers are increasingly turning to platforms like voice assistants and chatbots to book and manage travel, one device remains core to all these transactions, and that’s mobile. Travelers have a growing appetite to buy ancillaries over mobile, and they’re downloading as many travel apps as ever. So why is it that over half of travel brands are either not investing enough, or not investing at all, in mobile? 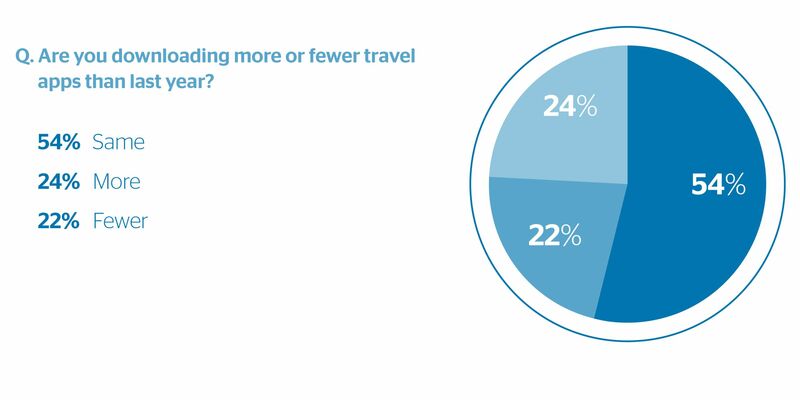 To find out more read the full Mobile Travel Trends 2019 report and see how traveler behaviour and industry insights are helping shape how travel brands define their digital strategy in 2019.